piper halliwell | tribute "i'm paralyzed"
de keuze van de fan: Yes, ALWAYS! (Part 2) Which picture of Piper do u like better? which piper's power u like the most and why?? Charmed is a toon about three estranged sisters named Prue (Shannen Doherty), Piper (Holly Marie Combs), and Phoebe (Alyssa Milano) who discover they come from a long line of powerful witches and are known to evil as The Charmed Ones. Despite being witches, they also have problems when it comes to love. Piper Halliwell is the eldest sister of the Charmed Ones after the death of her older sister, Prue. She is the wife of Leo Wyatt and is the mother of their three children; Wyatt, Chris, and Melinda Halliwell. Piper is viewed as the main character of Charmed and is considered to be the most powerful of the Charmed Ones.
. 1Be feisty. Piper was very feisty, she had a temper too, so this is one thing 100% necessary to be Piper. 2. Be emotional. Piper was very emotional, she had every emotion possible throughout the series. It's essential and a brilliant quality to have. 3. Be a great cook. Piper was an amazing cook, she was a chef at Quake, cooked all the dinners and loved doing so. Pick up a few cookbooks and throw together dishes of your own. Piper: Wait a sec. Last week we had no Dad and now we have two?!!!! Phoebe: How big was this dog again? Prue: Huge. Did u see the scratches on the attic door? Piper: What was it doing in the house? Prue: I don't know. Someone obviously left the front door open again. Phoebe: Why do u always assume it was me? What about Piper? Phoebe: Well, it's not a big deal. We checked the house and nothing is missing except my Pat Boone Christmas CD. Piper: Watch it! (Accidentally freezes the room) Oh, no. No, no, no, no, no. Not again! 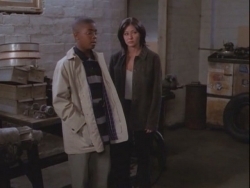 Prue: Now look at what you've done! Phoebe: This is my fault?! Piper: u guys aren't frozen? Phoebe: Guess that it doesn't work on witches. Prue: It doesn't work out here either. Piper: Oh! Tell me this isn't happening! Prue:Oh my God. What is it? What's wrong? Piper: Phoebe! Welcome home! It's so good to see you. Isn't it, Prue? a pop quiz question was toegevoegd: What did Piper say after Phoebe brought up vanquishing Natalie if they weren't able to vanquish the warlock? a comment was made to the poll: 😊 okay guys, let's update the club! Who is the director of season 1, episode 14?